Successfully Added PIR Security Monitor With Mobile MMS Notification to your Shopping Cart. Motion detection PIR sensor monitoring system that transmits security alerts to your mobile phone. Great new PIR (passive infrared) security device that sends pictures of suspicious activity to your cell phone. This portable style PIR monitor can be used as a single stand alone unit for a small room or aimed at a specific target (door, window, dogs playing poker painting, etc.). You can also use it as part of a group zone when covering larger areas. So how exactly does it work? Place it in the desired location, insert a SIM card with GPRS**, plug it in, and then send it a SMS message to activate. The PIR sensor is designed to detect motion in its field of view and then send you the appropriate alert. Once it is activated the monitor will send an MMS message with picture to your phone when the alarm is tripped. In addition to taking pictures, the monitor can also be set to sound an alarm type siren. In these tough economic times, why not save some money by doing some DIY work on your home office during your next holiday? This simple motion detecting PIR monitor system will provide you piece of mind for a relatively small price, and it comes at a much better price than those overpriced systems installed by so many of the so-called "professionals" these days. PIR monitoring system that transmits security alerts to your mobile phone. 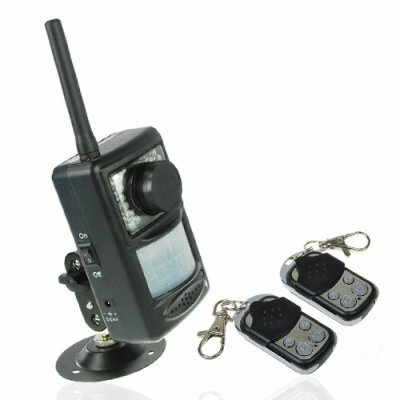 Can be activated / de-activated by either cellphone or keychain remote control. **SIM card placed into monitor and SIM card in your phone must have GPRS with MMS messaging capability. Some initial SMS messaging setup by the user is required. NOTE: This product is only compatible with GSM at the frequencies of 900MHz, 1800MHz.